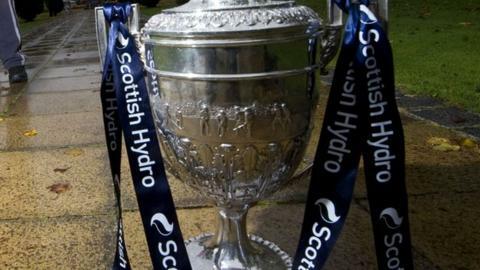 Shinty's first all-south Scottish Hydro Camanachd Cup final for almost 30 years, and played at the south venue of Mossfield Park Oban into the bargain, looks set to provide Scotland's "other" national game with a major showcase on 15 September. The game's premier trophy, and shinty itself, has for a long time been dominated by clubs from the north, but this year Kyles and Inveraray have turned the tables and won through to what will be a great afternoon in Argyll. Both sides have been enjoying major revivals of fortune in recent years and Kyles, this season and last, have also been the only club to pose a real challenge to Newtonmore for the Orion Premiership league title. And in this national knockout they have been scoring freely to dispose of Glasgow Mid Argyll 7-1 in the second round and Skye 5-2 after a long trip to Portree for the quarter-finals before a great performance ousted holders Newtonmore 2-1 in the semi final, also at the same Oban venue. Twenty-times cup winners Kyles, whose squad includes 50-year-old goalkeeper Kenny MacDonald, were the side who lifted the trophy when they beat Strachur 3-2 in the last all-south final in Fort William in 1983. But their only success since then has been in 1994 so there is a huge incentive here for the club from Tighnabruich. Up front their firepower includes the three Whyte brothers; Gordon and twins Thomas and John. Inveraray's route to this final has comprised the eclipse of three rivals from the game's north area with a 4-0 defeat of Strathglass before they edged Kilmallie 3-2 in advance of a 3-1 semi final victory over Kinlochshiel at An Aird Fort William. The middle years of the 20th century were not quite so kind to Inveraray so the third of their four successes was away back in 1930 before a 74-year wait was ended by a narrow win over Fort William in the 2004 final. That was their only success in three Camanachd finals since the turn of the millennium. But during this period they have been outstandingly successful in area competition, with 10 victories in the intervening 13 seasons in the AJG Parcels Celtic Society Cup for the south championship - including an amazing 14-0 eclipse of Taynuilt to lift the trophy this year. With firefighters Garry MacPherson and Russell MacKinlay, and Euan McMurdo who is a shinty development officer all prolific scorers, Inveraray also have considerable bite up front so both defences will have to be in top form if this is not going to be a high scoring game. There have been 15 all north finals in the Camanachd Cup since Kyles beat Strachur in 1983, so the scene is very much set for a day to remember for shinty in the south of Scotland.